Deputy Secretary-General Jan Eliasson (right) and Somali President Hassan Sheikh Mohamud sign a joint communiqué on preventing sexual violence. “We have in the past seen examples of uncoordinated international assistance around the world. As we prepare for a new Aid Compact, let us support Somalia and the Somali Government with one voice and with one common vision,” Mr. Eliasson said in his remarks. The conference, co-hosted by Somali President Hassan Sheikh Mohamud and UK Prime Minister David Cameron, takes place during what participants called in the final communiqué that capped the event, “a pivotal moment” for Somalia, as it rebuilds from two decades of factional fighting that followed the 1991 ousting of President Siad Barre. In 2011, Islamist Al-Shabaab insurgents retreated from Mogadishu, and last year, new Government institutions emerged, as the country ended a transitional phase towards setting up a permanent, democratically-elected Government. “The daunting responsibility of the Somali Government is to deliver, among competing priorities, a Constitution and elections in the space of just three years,” Mr. Eliasson said, noting the 2016 deadline for the current Federal authorities to adopt the fundamental laws of the country and to hold general elections. Mr. Eliasson highlighted four Government priorities in his speech, which he said, provided the basis for the London Conference: security, rule of law, coordination of international aid and protection of citizens. “The goal remains for Somalis to deliver security without outside assistance,” Mr. Eliasson said, adding that security requires capable and accountable institutions. 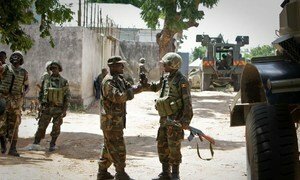 Security structures in the country have been backed since 2007 by the African Union Mission in Somalia (AMISOM). The AU Mission is supported by the UN Political Office for Somalia (UNPOS) and the UN Support Office for AMISOM (UNSOA). As of next month, those missions will be incorporated into the work of a new UN Assistance Mission in Somalia, to be known as UNSOM and to be based in the country’s capital, Mogadishu. The roles of the new Mission as mandated by the UN Security Council are also in line with the four priority areas outlined in the speech of Mr. Eliasson, who alluded to a potential UN peacekeeping operation in the country in the future. In the final communiqué, Conference participants recognized the role of the United Nations and the African Union in Somalia and welcomed their commitment to a strengthened strategic partnership. The participants also expressed their support for the Somali Federal Government’s “ongoing efforts to establish internationally recognised Somali waters” by eradicating piracy and other maritime crimes, as well as ending toxic dumping and illegal fishing. These topics will be on the agenda at the United Arab Emirates conference in Dubai on 11-12 September, according to the communiqué. On the second priority – the rule of law – Mr. Eliasson stressed the importance of functioning police, courts and prisons for security and State authority. Recent attacked against the Mogadishu Court House and the Deputy State Attorney have been condemned by Mr. Ban and other senior UN officials, who noted an increase in apparent targets in the country of judicial officials and the legal system as a whole. In his speech, Mr. Eliasson welcomed the opportunity to discuss reform of Somalia’s financial management system. Participants lauded Somalia’s efforts to tackle corruption and fund public services, and said they acknowledged “the Government’s financing gap and urgent need for short-term support to pay for salaries and operations,” according to the final communiqué. Women and children have borne the brunt of the war, not least sexual violence, Mr. Eliasson noted. He said the UN would support the Somali Government in developing protection and access to justice for victims. In that regard, the UN Special Representative of the Secretary-General on Sexual Violence in Conflict, Zainab Hawa Bangura, had earlier said her office would deploy a team of experts to Somalia in July to work alongside police and the military to assess their needs in the fields of training and prosecution related to sexual violence. On the sidelines of the London Conference, the Somali Government and the United Nations agreed on a joint communiqué on the prevention of sexual violence, which outlines the Government’s commitment to tackling the issue. It stresses, among other things that Somali authorities will sent “the clear signal that impunity will not be tolerated” and tat perpetrators will be punished. The Security Council today voted unanimously to establish the United Nations Assistance Mission in Somalia, to be known as UNSOM and to be based in the country’s capital, Mogadishu, beginning on 3 June for an initial period of 12 months.